Because the Internet is a silly place, the 30-ton black granite sarcophagus unearthed in Alexandria earlier this month became something of a meme. It looks so deliciously ominous that the plan to open it sparked a viral wildfire welcoming/warning the demonic powers sure to be unleashed once the lid was pried up. 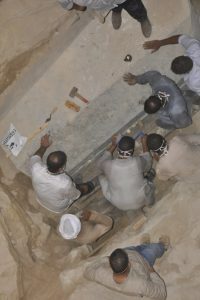 Fearing no plague-wielding revenants or curses from ancient gods, a team of experts dispatched by the Ministry of Antiquities opened the sarcophagus on Thursday. The first glimpse inside revealed a red fluid filling much of the coffin. 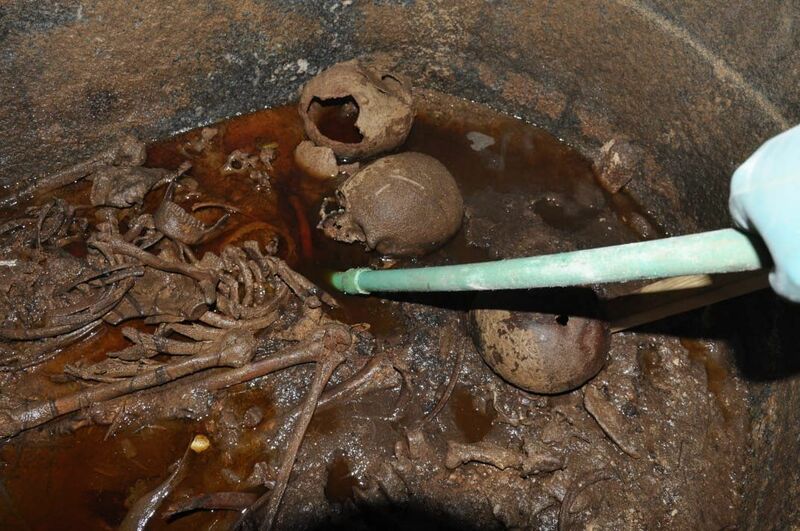 It smelled so putrid that the team left the lid off for an hour before attempting to remove enough of the liquid to see what else might be in the sarcophagus. 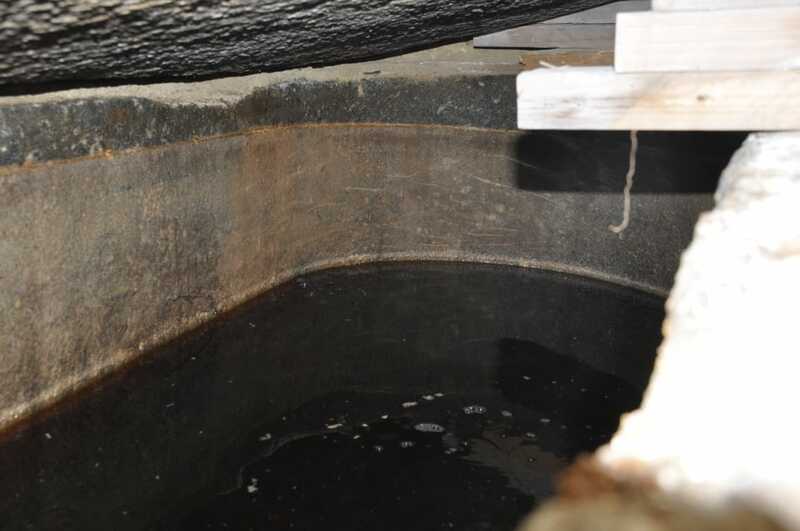 The foul fluid was removed one large jug at a time. When they got down to the lees, the team found the skeletal remains of three individuals. They had originally been mummified, but the liquid turned out to be sewage water that had leaked into the coffin via a crack on the east side and it had eaten away at the mummified tissue leaving only the bones. The lack of inscriptions on the sarcophagus indicated that it did not belong to a pharaoh or king. When it was first discovered, Antiquities Minister Mostafa Waziri surmised that it might hold the remains of a priest as someone who would have had the social significance to command so large and impressive a coffin. Preliminary examination of the bones tells a different story. One of the skulls has multiple fractures, the result of sharp-force trauma that indicate he died in battle. The other two skulls are intact. All three appear to be male. The mummies are being moved to the Alexandria National Museum which has a state-of-the-art laboratory for the conservation and study of ancient remains and artifacts and the high-tech security system to keep them safe during the process. There they will be X-rayed and analyzed to determine their ages at time of death, map their facial features and pinpoint their dates. The sarcophagus will be raised from the pit with a mechanical loader. Cars have been temporarily exiled from the street to make way for the behemoth that will lift the black granite behemoth out of the ground and transport it to the Military Museum in the adjacent military northern region. The pit will then be scanned with metal detectors and excavated further to make sure all artifacts are recovered. Lastly, the miasmic nameless horror that was released by these unwitting fools will spread over the world and swallow us all until we hear naught but the grinding of gizzard stones and taste naught but the burning bitterness of stomach acid for all eternity. This entry was posted on Thursday, July 19th, 2018 at 11:06 PM	and is filed under Ancient. You can follow any responses to this entry through the RSS 2.0 feed. You can skip to the end and leave a response. Pinging is currently not allowed. What? No word on the oculus this object was blocking? DON’T THEY KNOW THIS IS THE PORTAL TO DIMENSIONS OR PLACES UNKNOWN AND IS THE LIKELY PORTAL THROUGH WHICH THE DEMONIC/ALIEN INVASION WAS SUBVERTED BUT NOW WILL COMMENCE? Very interesting discovery- and update! I guess I’ve been around some vile situations, cause I could imagine this one much too vividly! Ugh- the industrial maintenance jobs can be rough. But serious science really does bear down through worse putrid reality to bring us the truth! Marine Biology especially! Archaeology this time! Wow, my respect to the researchers there! While in much later years –traditionally– the first son inherited the property, the second son was sent to perish in war and the third son became clergy (to a parish), it seems as if in this particular case all three of their sons died in battle (note the hole in the second skull). In case, they were all clergy, however, there is a likelihood that they were early Christian, who –traditionally– were slaughtered as if in battle. AND LO! WHEN THE LID WAS LIFTED THE FOUL DEMON WAS RELEASED FROM ITS VAT OF BLOOD, CONTAINING ALL THE BODIES IT HAD CONSUMED DOWN TO THE LAST MORSEL. THEREON ALL FLED BEFORE IT, GAGGING AND CRYING, AFEARING THAT THEY SHOULD BE OVERCOME BY THAT DEMON WHO SHALL FOR EVER BE KNOWN AS ‘PUTRID SEWAGE’! So, can we speculate it contained Alexander the Great’s poop? If they weren’t Christians executed by pagans, maybe they were pagans executed by Christians. Though in at least one case Christians in Alexandria seemed to prefer mobing pagans and tearing them limb from limb. A question: if these were christians, would they not have been buried in a more natural manner? I thought christians in Egypt generally didn’t do mummification? I dont understand where some of you decided that it might be a Christian burial. Because the Minister of Antiquities said “Priest” ?? Pagans had priests, Christians did not mummify. Susie, of course our ‘Three Holy Kings’ could be just anything. Romans, Greeks, Persians, Egyptians, the ‘Three Magoi’ …you name it. Of course, there are Christian mummfication(s), ‘natural’ ones or people get their brains deeply frozen and hope there will be some kind of ‘resurrection day’. There are all kinds of different processes that were -and still are- commonly used. What we can say, is that there probably were no Christians before Christ, Or you would at least not call them like that. The sarcophagus has no inscriptions and there are no grave goods whatsoever. Their vault looks like just any other early Christian vault in the eastern Mediterranean would. That they are ‘brothers’, killed in harmony and buried with at least some form of decency, is of course sheer guesswork. No Christians before Christ?? Well,,,,, of course not. But there was monotheism before Christ. What was Christ…..? And early Christians were not mummified. And most probably if they were buried in a sarcophagus it would be marked with a primitive cross. The Black Sarcophagus of Nasty.